Is this goop fit to drink? An eruption of harmful algae (cyanobacteria) at Pelee Island, Ohio, in Lake Erie, 2009. On Aug. 2, half-a-million residents of Toledo, Ohio were told to quit drinking city water that was laced with microcystin, a toxin produced by a carpet of blue-green algae in Lake Erie, Toledo’s water source. after concentrations dropped, the water ban that put the long-simmering problem of harmful algal blooms in the headlines was lifted on Aug. 4. The shutoff was a public wake-up call about the harm of allowing lakes to get too fertile, but it was no surprise to experts who have long warned that excess plant nutrients in freshwater can feed blooms of toxic algae, properly called cyanobacteria. Agriculture, development and population growth are all stressing freshwater, which is so essential that the search for life in space concentrates on planets warm enough to have liquid water. 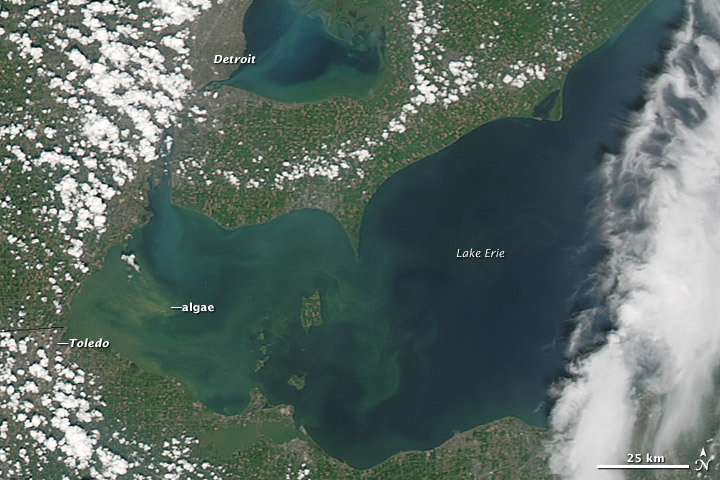 The “Holy Toledo!” bloom of cyanobacteria seen from space. Toledo is at the far western corner of Lake Erie. 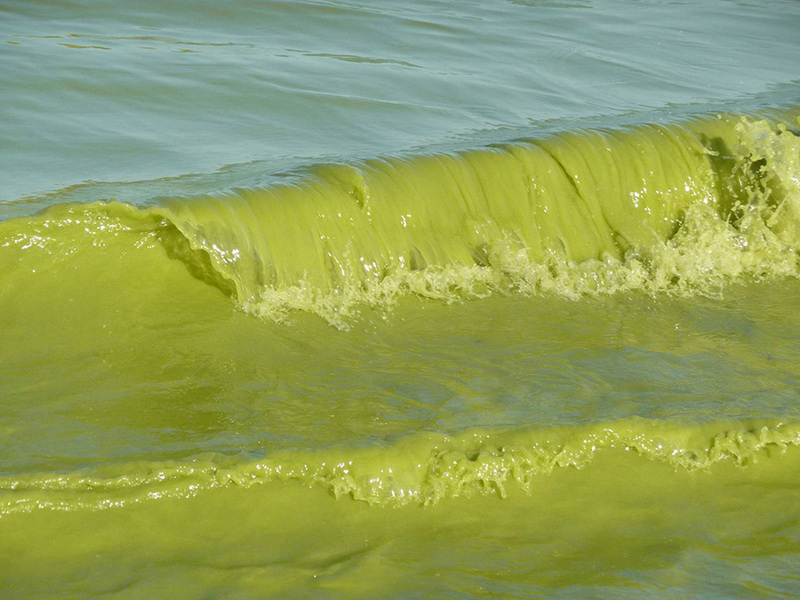 Toledo’s problem was, in the jargon, a harmful algal bloom (HAB). The toxin in question, microcystin-LR, is toxic to the liver; but HABs can also create nerve toxins and many other poisons. These toxins may be hazardous on contact, or when inhaled or ingested. 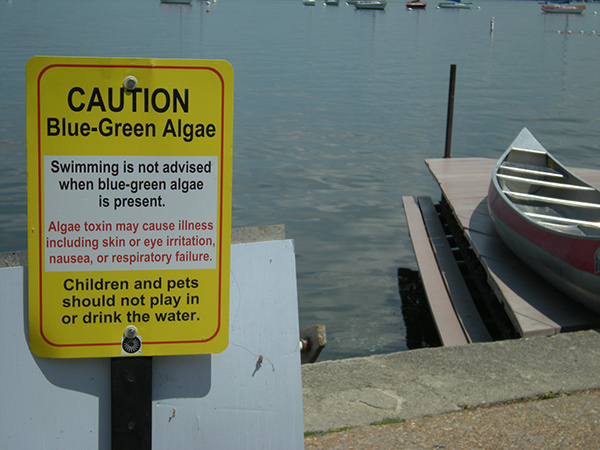 Even blooms of non-toxic “nuisance algae” can annoy swimmers and boaters, or change the ecosystem by blocking sunlight or depriving water of oxygen as they decay. Although do-not-drink orders are rare, outbreaks of cyanobacteria and other HABs are widespread in the United States, China and Europe. HABs are one common aspect of eutrophication – a complicated process of decline initiated in large part by over fertilization. 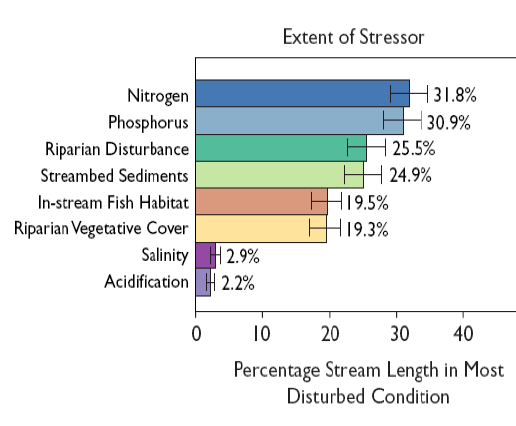 A 2006 assessment of stream quality found that of U.S. river and streams had dangerously high levels of phosphorous (31 percent) and nitrogen (32 percent). These conditions more than doubled the risk to stream health. 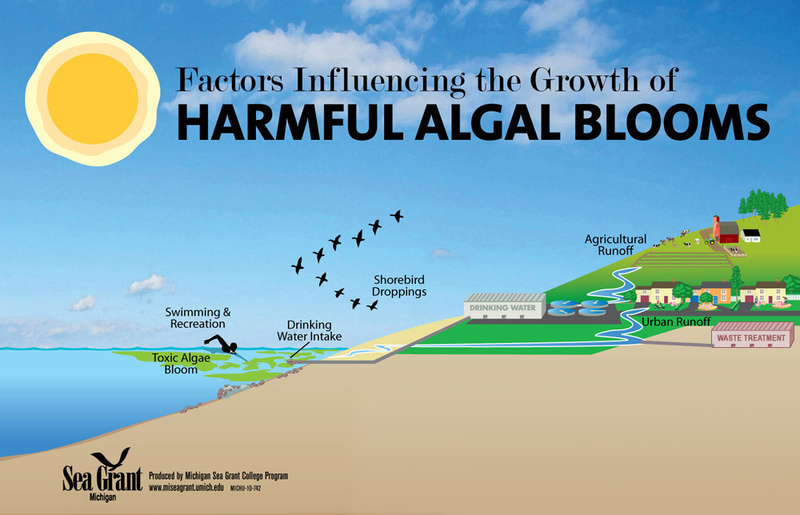 Harmful algal blooms occur naturally, but have increased since the mid-1990s. Malfunctioning septic systems, products with phosphates, and urban and agricultural runoff contribute to more frequent harmful algal blooms. Some scientists link the increase of HABs to the invasion of zebra and quagga mussels in the Great Lakes. The filter-feeding mussels eat the benign algae and phytoplankton, but release organisms like cyanobacteria back to the water intact. A large bloom currently plagues Lake Winnebago, Wis. with concentrations of microcystin ranging from 1 to over 2000 micrograms per liter. Rollover photo to see researcher Todd Miller taking a lake sample in a project funded by the National Institute of Environmental Health Sciences Oceans and Human Health program. Like an unwanted guest, phosphorus, once in a lake, tends to stay around for decades. 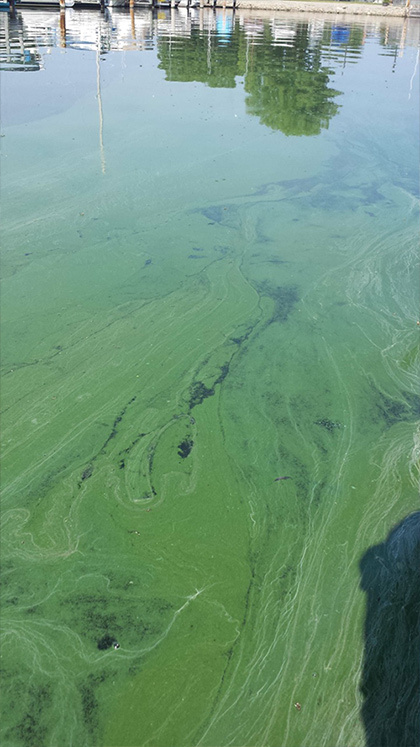 In shallow lakes like Erie, which warm quickly in the summer, toxic cyanobacteria can explode and release a variety of toxins. A similar problem plagues much smaller lakes. Lake Winnebago in Wisconsin, for example, supplies water to the nearby cities of Neenah, Menasha, Oshkosh and Appleton. Miller has measured 10-fold changes in the concentration of toxin in Lake Winnebago within 12 hours, as wind and water turbulence affect their abundance. Gas chambers in cyanobacteria inflate during the day to take advantage of sunlight that drives photosynthesis. There are no federal standards for HAB toxins in freshwater, but the liver toxin microcystin-LR has appeared above 2000 micrograms per liter in Lake Winnebago. Another cyanobacteria product, the potent neurotoxin anatoxin-A, occurs at much lower concentrations. As the hazards of cyanobacteria become more obvious, “Do-not-swim” signs are proliferating across the United States. The water supply plants in the four cities use filtering, treatment with ozone or ultraviolet light and chlorination, and Miller and his colleagues are testing which methods or combinations work best on several toxins. They have found that these treatments appear to be holding microcystin-LR below the World Health Organization drinking water standard of 1 microgram per liter. 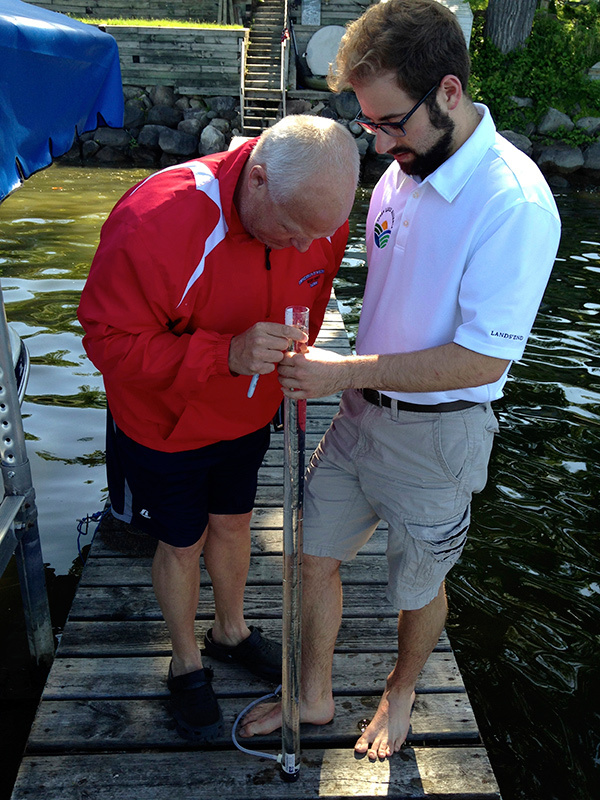 Volunteer Jeff Schraml, left, and Paul Webb, a Clean Lakes Alliance staffer, measure water clarity on Lake Waubesa, near Madison, Wis.
Photo by Katie Van Gheem, June 6, 2014. Although Lake Mendota does not supply drinking water, it is eutrophying and contains cyanobacteria. The lake is called the “best studied lake in the world” due to the presence of the world’s first department of limnology (freshwater science) on the shore at UW-Madison. Progress, or holding the finger in the dike? 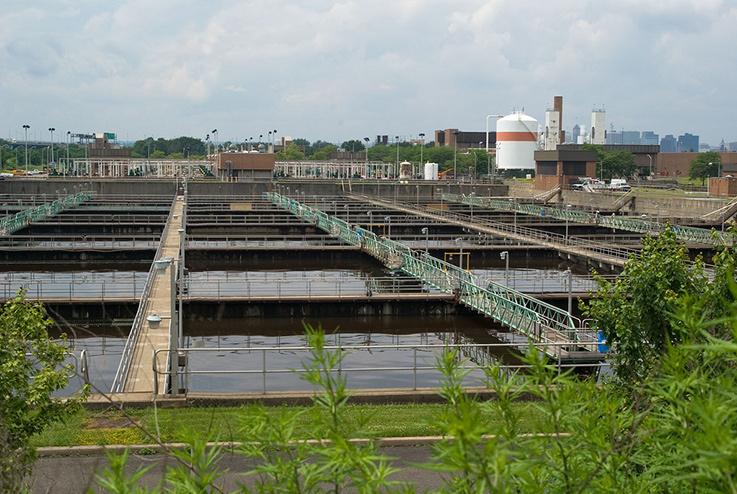 Wastewater treatment plants are among the pathways by which harmful chemicals are filtered before entering Great Lakes. This manure digester, located near Waunakee, Wis., serves nearby farms. 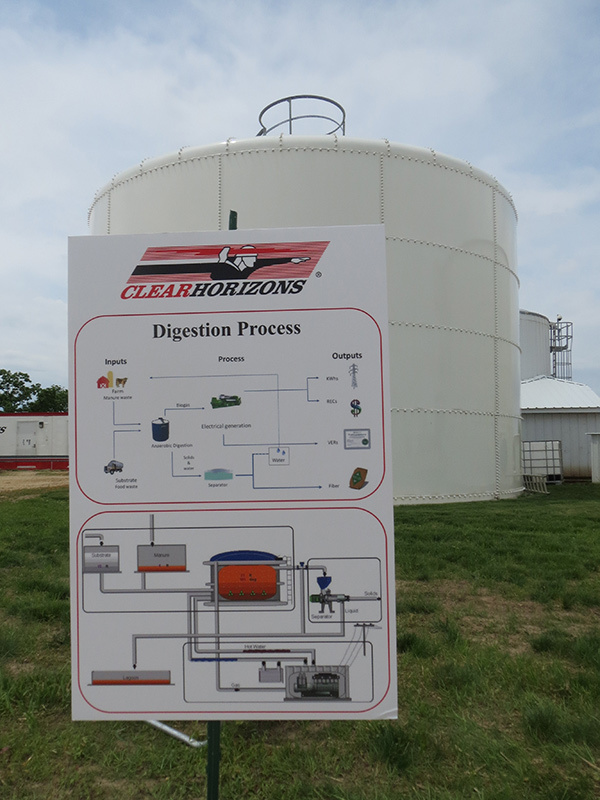 The digester creates methane and leaves a byproduct with less potential to pollute surface waters. All other things being equal, higher levels of phosphorus in the soil equate to more runoff. The digesters reduce wintertime spreading of manure, when it’s likely to run off into streams, Lathrop adds. “We can put it on when its warmer, and it will stay with the soil. The digesters, together with no-till planting, buffer strips and cover crops, do a better job of keeping the soil in place, but if you keep adding more fertilizer and manure to the land,” phosphorus runoff will not drop. A map of the Yahara River and its watershed in south-central Wisconsin. 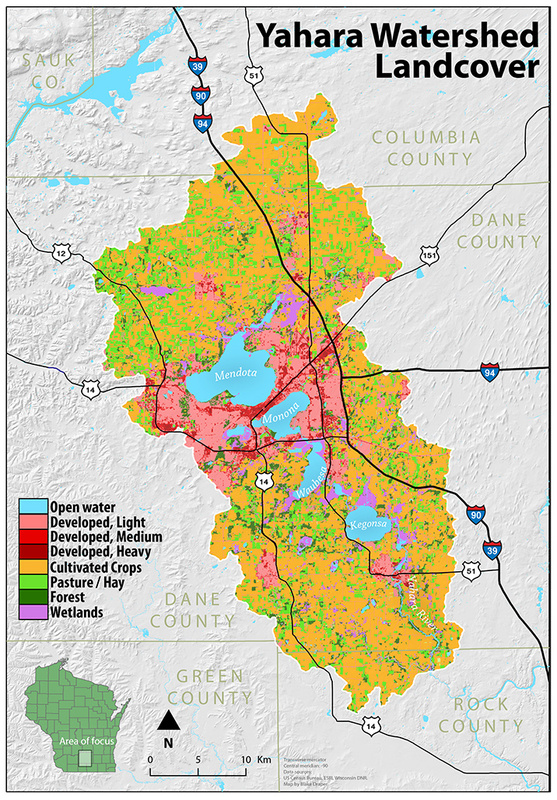 The focus of phosphorus-reduction efforts occur northwest of Lake Mendota. Given opposition by the agricultural and fertilizer industries, nutrient regulation seems unlikely, leading to the testing of dozens of voluntary programs to reduce over-fertilization. A key selling point: phosphorus is costly, and there’s no sense wasting money on unneeded fertilizer. 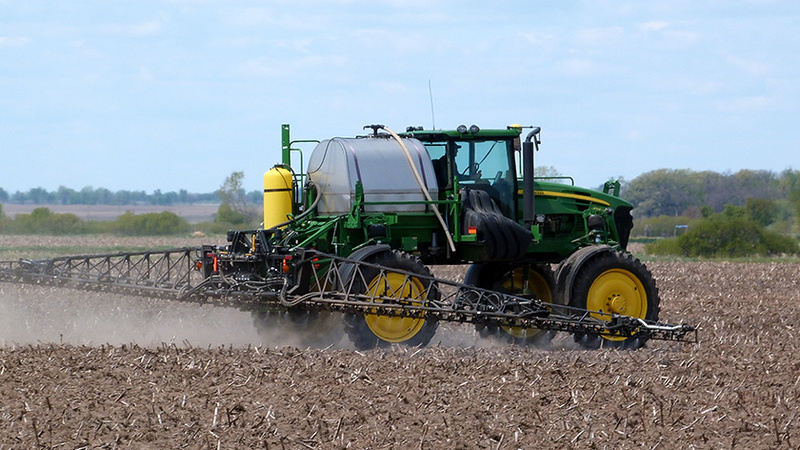 Using a self-propelled sprayer, Jeff Nesler of Nesler Krueger Grain Farms applies fertilizer and herbicide to a field east of Genoa, Illinois. Farmers get certified into the program after a crop and soil assessment, and a conversation with a farm conservationist. Certified farms are eligible for cost-sharing for contour and conservation tillage, and injection and composting of manure. 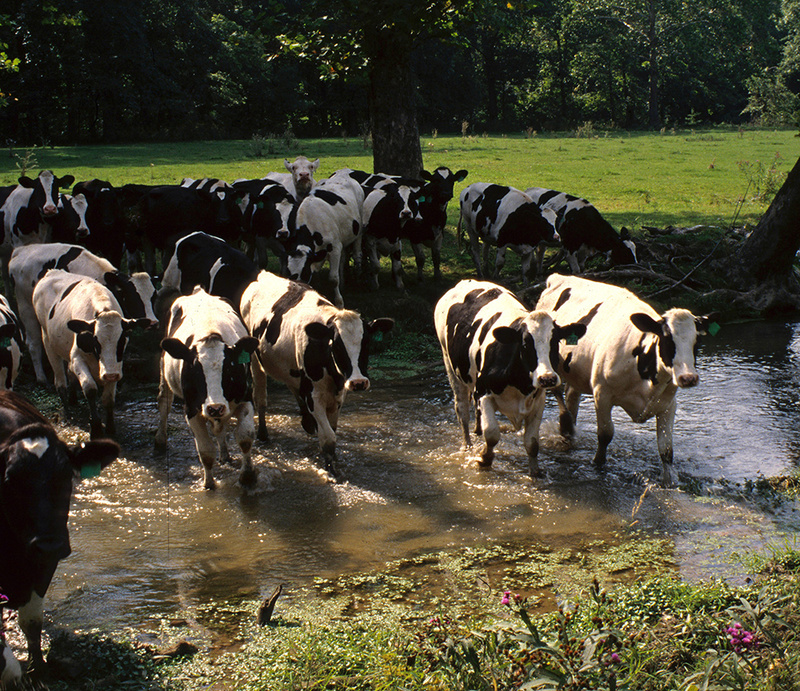 “I didn’t see no fence, did you?” Cows in a pasture walk across an unfenced stream, causing erosion and downstream sedimentation and fertilization.